A decidedly "bleh" homage to Sherlock Holmes, which reaches a nadir of unreadability with "The Startling Events in the Electrified City." I couldn't finish the story and thought of giving up on the collection entirely. I persevered, however, and the remaining stories weren't too bad. Just not "too good." 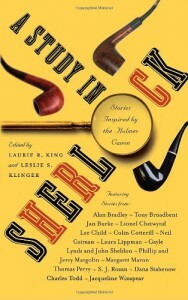 Except for one story, "The Last of Sheila Locke-Holmes," which has nothing to do with Holmes but is about a young girl dealing with her parents' marital problems, and quite good. And I will mention one more story - "The Adventure of the Concert Pianist" - to say that it shamelessly steals the murder plot from Umberto Eco's The Name of the Rose, except there's no insane monk.